These people found a way to combine their fears. 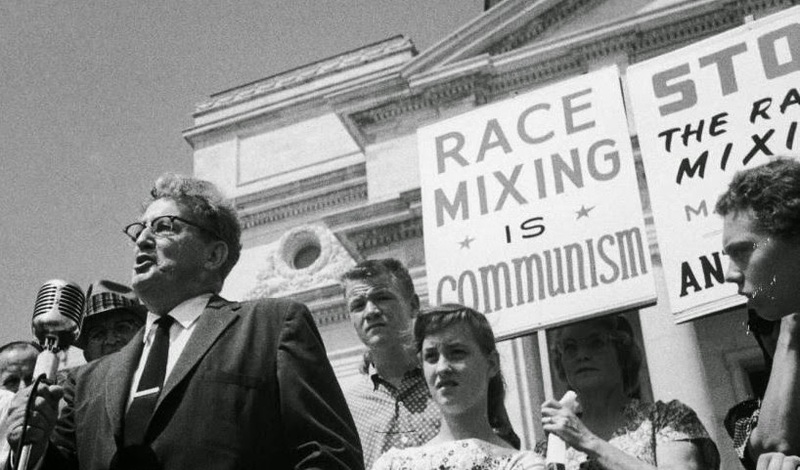 Racism was very prevalent in the US in the 1950s and 60s. Isn't the Age of Consensus great? America is strong, its people are free, and there are no problems! Except there were. In this section you'll examine the darker aspects of American society from 1945 to 1989 by looking at three areas: racial conflict, urban poverty and drugs and crime. Racial conflict came to be one of the defining issues of the 1960s in the US. Civil rights marches and protests gathered steam, and Martin Luther King announced his dream to over 200,000 people in Washington that his children might some day "not be judged for the colour of their skin, but for the content of their character". Urban poverty was an issue throughout the years we'll look at. Several presidents have had grand ideas to eliminate poverty, but how successful have they been? As we will see, this poverty lended itself to drug use and high crime rates, which had Richard Nixon campaigning against crime in 1969 and Ronald and Nancy Reagan urging young people to "Just Say No" to drugs in the 1980s. What was life like for African-Americans before World War II? How did this change after the war? What influenced this change? Desegregation: How did desegregation take place in the Army? In education? In bussing and transport? What happened with James Meredith? Civil Rights Movement: What early protests were organised? What was Martin Luther King Jr.'s role? What happened in Birmingham? What happened in Washington? Why did conflict arise between African-American leaders? Government Reaction: In what ways did the federal government oppose states that were practicing racial discrimination? How did life for African-Americans begin to change? How did the civil rights movement inspire other national minorities in the US? What were the main causes of urban poverty? How did ghettos form? How did housing and tax policies affect poor people? How was President Johnson's Great Society programme meant to help people in poverty? What actions did he take in his war on poverty? What were the results? Why did the Watts Riots take place? Why did riots spread? What was their impact? Why did crime levels rise in cities after World War II? How did drugs come to be involved in urban crime? How did this link develop by the 1980s? What concerns did American people have about these issues? How did the US government respond? 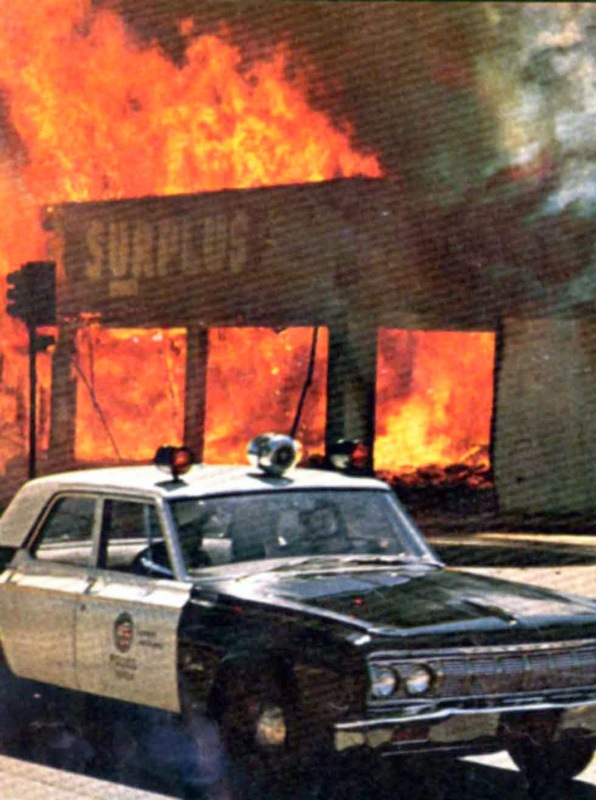 A fire rages behind a police car in the midst of the Watts Riots in 1965. 2015: Why did the Montgomery bus boycott (1956) take place, how was it carried out, and to what extent was it successful? 2014: Why did race relations remain a major issue in the US, 1945-1989? 2011: What was the contribution of Martin Luther King to US affairs? 2007: In what ways did the Montgomery bus boycott, 1956, advance the cause of the civil rights movement? 2006: During the period, 1945-1989, what was the impact of one or more of the following on American society: racial conflict, urban poverty, organised crime? 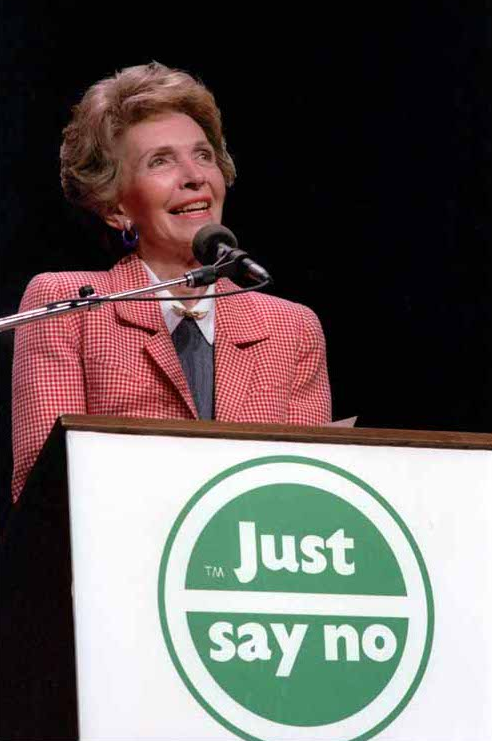 First Lady Nancy Reagan promotes her husband's administration's War on Drugs in the 1980s.